Hockey cards or chocolate bars? Growing up in Nova Scotia, Ken Reid always knew the answer to the question. 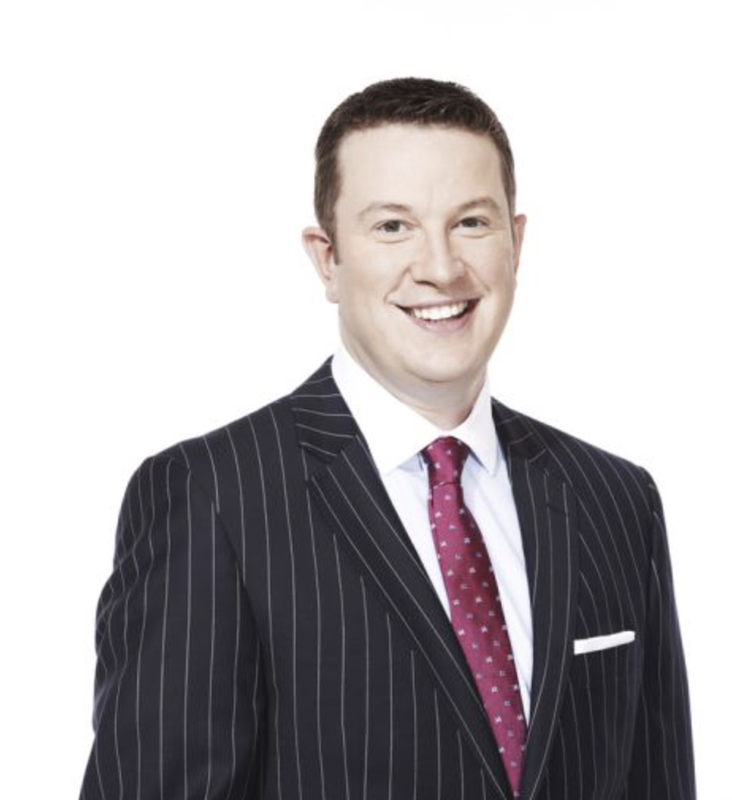 Reid lives in Toronto now, where he co-anchors the weeknight prime-time edition of Sportsnet Central with Evanka Osmak. If his hockey-card collection has grown over the years — it’s an accumulation, now, of more than 40,000 — his love of sports is what it always has been: intense. In a career in media spanning 20 years, he’s covered Grey Cups and Super Bowls, Olympics, and Stanley Cup finals. His books are all hockey-minded: he followed Hockey Card Stories: True Tales from Your Favourite Players (2014) with One Night Only: Conversations with the NHL’s One-Game Wonders (2016). For his latest, published this fall, he collaborated with an eponymous prolific former Washington Capital on Dennis Maruk: The Unforgettable Story of Hockey’s Forgotten 60-Goal Man. Today, as part of Puckstruck’s ongoing series, Ken Reid recalls his first brush with NHL hockey. The thought of seeing real life NHLers live and in colour was always a childhood dream for me — and when I say dream I mean dream. I grew up in Pictou, Nova Scotia. Basic geography tells you that’s a long way from any NHL rink, especially for a hockey-obsessed 10-year-old. Peter and I hopped on a plane for the first time. We flew to Montreal with Dad and checked in to the Queen Elizabeth Hotel. That night, Saturday, March 14, 1987, we saw the Montreal Canadiens play the Philadelphia Flyers. The ice was so white. And so far away. We were at the top of the Forum, way up behind one of the nets. 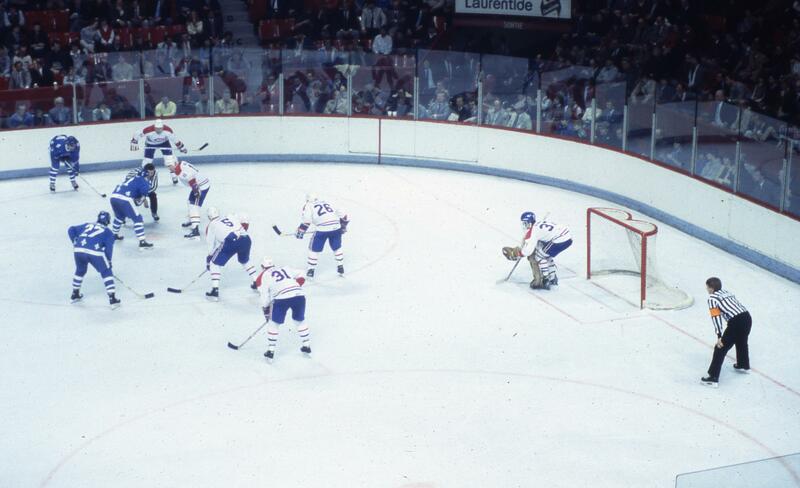 I remember having to bend down to see the play at the other end of the ice. But I was there. The NHL was right in front of me. I couldn’t get over how clean the Forum was. And the building had escalators. Escalators in a rink! I can’t recall who won off the top of my head — although a quick check on the web tells me the game ended in a 3-3 tie. More than just the game sticks out — things like strolling Saint Catherine’s Street with my brother and Dad quickly come to mind. My brother and I were terrified of the big city on day one. By day two, we couldn’t get enough of it. And Dad took us to eat at the famous Bar-B-Barn. On the Sunday night we saw Team Canada ’72 and the USSR play in a 15th anniversary game at the Forum. Then Monday, we were in the expensive seats for the Habs and the New York Islanders. We didn’t have to bend down in our seats to see the action that night: it was all mere feet away. I was 11 years old and in heaven at the Forum. Thanks, Dad. Saturday night’s Flyers game saw goaltender Ron Hextall play his best game in weeks, according to the Philadelphia papers. The Flyers were riding high atop the NHL’s Patrick Division; Canadiens were second in the Adams. Canadiens got goals from Mats Naslund, Guy Carbonneau, and Claude Lemieux. Dave Poulin, Mark Howe, and Scott Mellanby scored for Philadelphia to take the game into a fruitless overtime. The New York Islanders were running second to the Flyers in the Patrick Division. Monday night saw Canadiens blank them 3-0 on the strength of Brian Hayward’s first shutout in four years. Gaston Gingras, Ryan Walter, and Claude Lemieux scored for Montreal. Jean Béliveau, thoroughbreding through centre! Frank Mahovlich, moosing down the wing past the Montreal blueline! Forgive all the exclaiming, but I’m not sure there’s any other way to translate the footage to the page. Terry Sawchuk! Eddie Giacomin! Gump Worsley in full flop! Toronto’s Bob Pulford looking downcast! Béliveau wailing on Reggie Fleming of the New York Rangers! Phil Goyette, not seeing the shot that hits him amidships and drops him to the ice in painful anguish that causes you to shift in your seat, especially if you happen to be male! J.C. Tremblay carried off on a stretcher! One lonesome overshoe on the ice! The rink crew scraping up bloody slush! Toe Blake in a porkpie hat, chewing his chaw! Béliveau pressing a towel to a cut! Great goal, Claude Provost! Blades And Brass is a masterpiece. Is there any doubting this? Watch it, the whole thing. It’s not long. Me, now — watching these 50-year-old scenes, I’m just not sure how I’m going to be able to endure the plain old modern non-mariachi NHL. National Aboriginal Day today, in Canada, for one last time. This morning Prime Minister Justin Trudeau announced that from here on in, the name will change to National Indigenous Peoples Day. Either way (on any day), Jim Logan’s work deserves your attention. 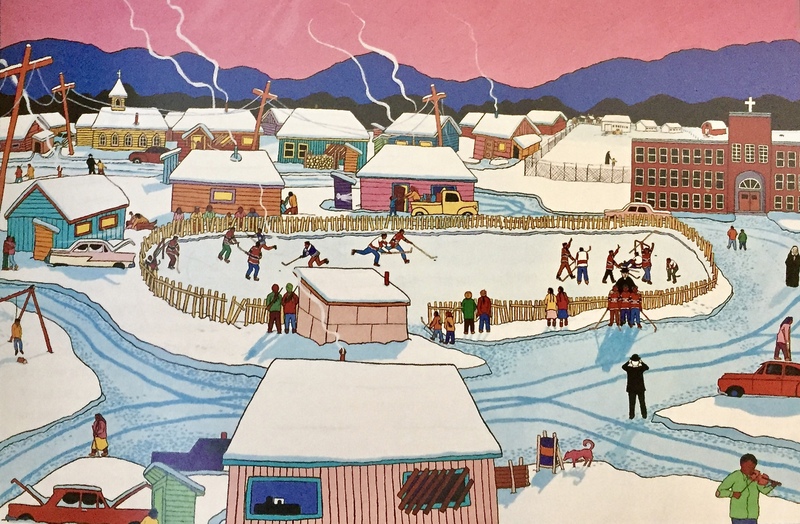 If you’re in Ottawa or Gatineau any time this summer, his powerful 1991 suite of seven “National Pastimes” paintings are on display as part of the Canadian Museum of History’s “Hockey” exhibition. The largest of the canvasses (above) depicts an ostensibly serene and all-Canadian winter scene in an interior British Columbia reserve town while the six smaller works that accompany it frame a series of close-ups. Attention to detail is worth paying: off the ice in the main canvas, away from the heedless joy of the afternoon’s shinny, it’s a panorama of pain and danger. A couple brawls in the snow. A suicide hangs from a swing-set. In “Father Image 1,” a stern-faced white priest makes his claim on a trio of grim, stoical boys. It’s also personal: in the window at the bottom of the (main) frame, a father and son watch TV together. I had grown up watching a lot of hockey, and I realized the one I watched a lot of hockey with was my dad. However, my relationship with my dad was never as close as I wanted it to be. His rough upbringing, war nightmares, and alcoholism all contributed to the distance between us. However silent as our relationship may have been, we loved each other. My dad’s interest in hockey naturally drew my interest and hockey became the dominant link between us. But our reasons for watching were so different. He dreamed of being somebody important, somebody respected. He wanted to be a winner, but fate wouldn’t allow it. I watched hockey because it brought me closer to my dad. Hockey to me was togetherness. On Saturday night, for three whole periods, we were on the same side, cheering for the same team (Montreal) and the same players (Jean Béliveau and John Ferguson), and his past, and our reality didn’t threaten us. We were as close as we could ever get. Today watching hockey or painting about it brings back those warm memories, but it also brings back the distant relationship my dad and I had. The paintings in this series are an extension of my personal experience. The social statement I am expressing here is that for many kids, Aboriginal or not, hockey is often more than just a sport, it’s an escape. 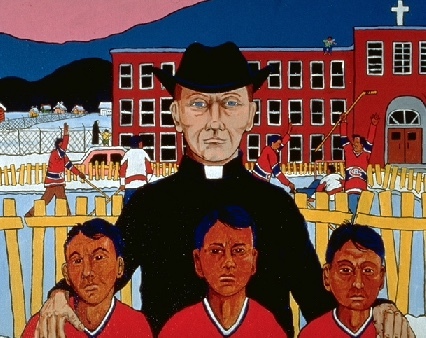 In these paintings you will find evidence of the tragic realities of life that are temporarily forgotten by those involved with the game that has been titled Our National Pastime. For more of Jim Logan’s work, visit his website. 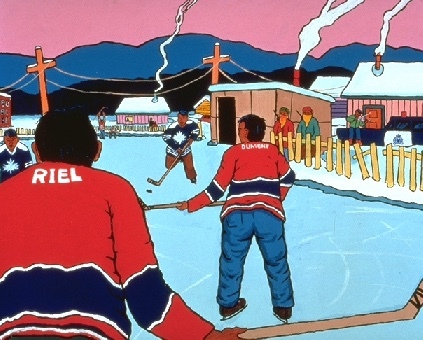 The Canadian Museum of History’s “Hockey” exhibition continues until October 9. After that — from November 24 through to April 29, 2018 — it will be at Montreal’s Pointe-à-Callière Museum. He was the first St. Louis Blue ever to sit out a penalty, which seems about right. Called for hooking just a minute into the Blues’ NHL debut in a 2-2 tie with the mint-new Minnesota North Stars in 1967, Bob Plager did get back on the ice in time to assist on the team’s first goal, scored by Larry Keenan. That’s worth recalling, too, after Plager’s place in Blues’ history was formally recognized in a ceremony on Thursday at the Scottrade Centre by way of retiring his number 5 and raising it forevermore to the rafters. Plager, who’s 73 now, hails from Kirkland Lake, Ont., and is (of course) one of three defence-playing brothers to have worn St. Louis blue in the team’s early years. Elder brother Barclay died in 1988 while Bill, two years younger than Bob, died last year. Barclay’s number 8 sweater was already hanging in the rink rafter, which means that with Bob’s joining it, the Plagers are just the second pair of NHL brothers to have their numbers retired, after Maurice and Henri Richard. Anyone in the NHL is tough or they would not be there, he said, but some players are tougher than others, and not all tough players are good fighters. It takes a special attitude, a capacity for anger. John Ferguson is a good fighter but Spencer does not respect him because at times he suspects fighting is all Ferguson can do well. He respects Ted Green of Boston, Vic Hadfield of New York, Barry Gibbs and Ted Harris of Minnesota, Bob Kelly of Philadelphia, Marc Tardif of Montreal, Bob Plager of St. Louis, and Rosaire Paiement of Vancouver. He respects them, but he will fight them anytime, anywhere. In a contentious game at Philadelphia’s Spectrum in January of 1972, Blues’ coach Al Arbour crossed the ice at the end of the second period to lodge a protest with referee John Ashley who, in turn, assessed Arbour a two-minute penalty whereupon Arbour followed Ashley into the tunnel as he departed the ice and then the St. Louis, led by Bob Plager, were climbing into the stands, swinging their sticks. Someone poured beer on me and someone else hit me. Everyone was shoving and pushing and I fell on a policeman. Then I got hit on the head by a billy club. I never hit a policeman — I’d never do that. Arbour and three of his players, none of them named Plager, were charged with disorderly conduct and assault and battery on a policeman. In a pre-season game in 1973 in Brantford, Ontario, Blues and Pittsburgh Penguins, a bench-clearer of a brawl ensued, after which Plager was suspended by NHL president Clarence Campbell after he (CP) “physically interfered with game officials and threatened physical violence to referee Andy van Hellemond.” The ban lasted for two regular-season games. Plager, who came to the Blues seven years ago as the club’s most eligible bachelor, announced his engagement to Robyn Sher, a secretary he met at Jewish Hospital two years ago. Robert Plager is a member of the Punching Plagers — his brothers are Barclay and Billy — who have fought most of the leading pugilists on ice — including each other. Look, the first time I come up to the NHL, it’s for a game in Madison Square Garden, against Chicago. We’re losing 6-1 and it’s in the third period. I still haven’t been off the bench. The fans are starting to yell: “Bring on Plager.” There had been some advance publicity on me. Suddenly, I’m out therefor a faceoff in their end. I’m scared stiff the puck will get past me and they’ll have a breakaway. They’ve goy Stan Mikita doing the face-off. Just like I feared, the puck hops past me and here comes Mikita. As he goes to pass, I stick out my hand clothesline him. I been on the ice seven seconds and I got a penalty. On the next shift, I knock Bobby Hull into the boards. I flatten him. Hull and I always had a funning feud after that. Anyway, the point I want to make is that, for the next game, the fans have Bob Plager banners hanging from the balcony. Let me tell you something. 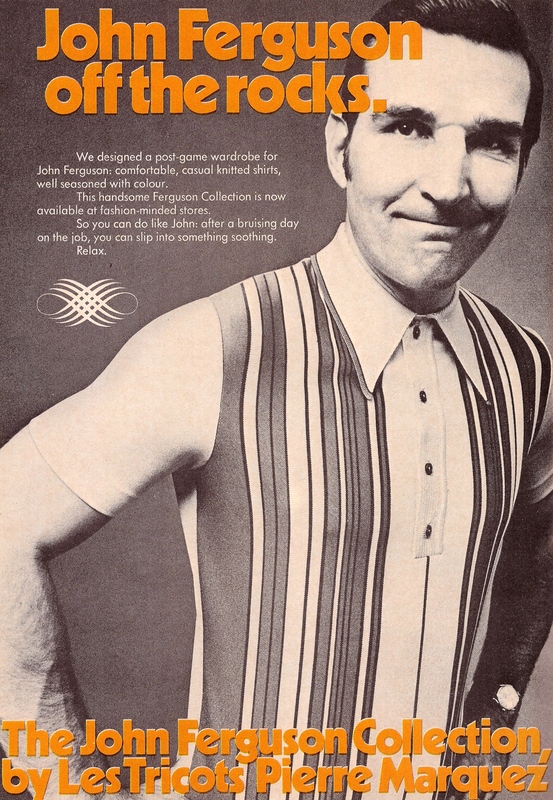 In St. Louis, I’ve been voted most popular player, most colourful player and I did more commercials than the big shooters. You think that was because of the two goals I scored? 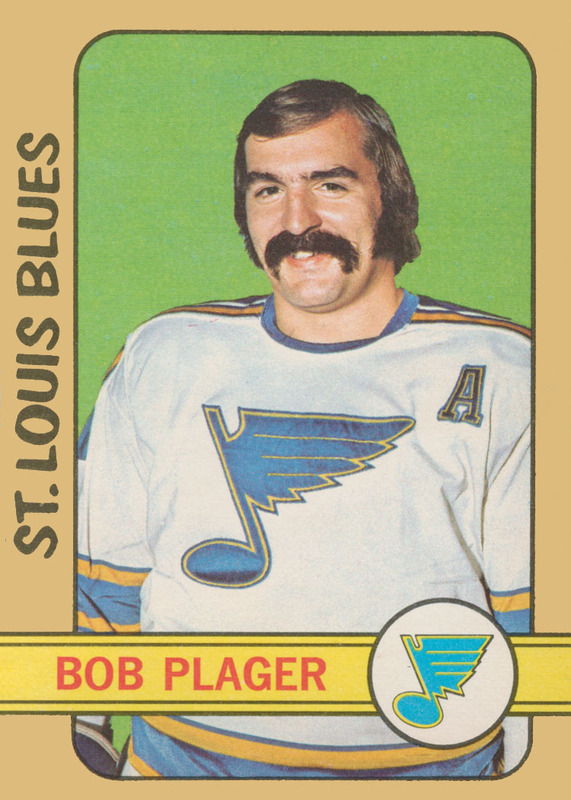 Police said that the two Blues defencemen were drinking at a restaurant when somebody apparently spilled soup on Bob Plager. He then got into an argument with bartender Alfredo Castillo. Police are uncertain as to what happened next. Most of the witnesses fled before police arrived. But there was apparently no exchange of blows. Bob was cut by glass and treated at St. Louis County Hospital. Castillo was not injured. The manager of the bar-restaurant said the Plager brothers chased the bartender with pots of coffee and hot water and that Castillo held them off with a small knife. The manager also claimed at least a case of liquor was broken in the melee. No charges have been filed. The Canadian bench empties. Even Dryden goes lumbering all the way down the rink to join the ecstatic mob of white sweaters hugging, patting, squeezing and slapping Henderson. The Soviets skate sluggishly about, stunned, their faces drained of hope, their cause apparently lost. 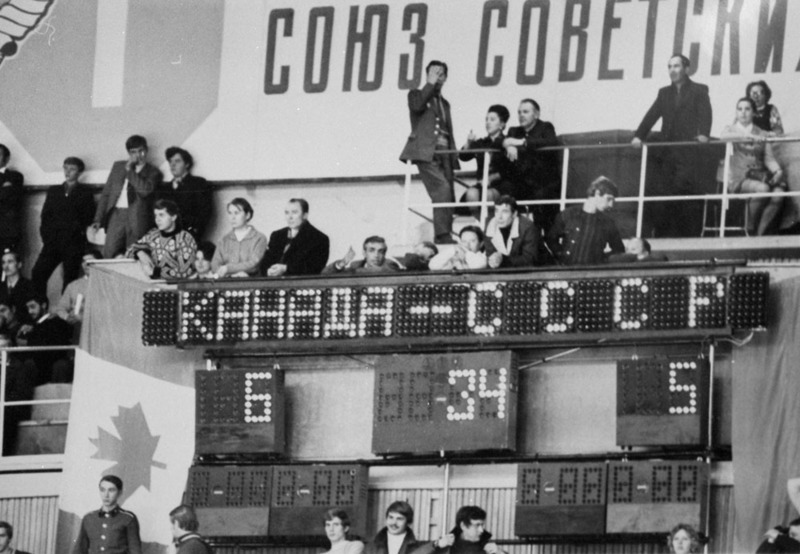 Yet thirty-four seconds remain to play, and the Soviets are gifted with the power to score a sudden goal. It’s easy to imagine them tying this one up in thirty-four seconds, thus tying the series, and going on to claim victory on goal-differential. Sinden stays with Stapleton, who was on the ice for the goal along with Savard. He sends out White and his two steadiest defensive forwards, Ellis and Peter Mahovlich, to join the indefatigable Esposito. The five don’t let the Soviets anywhere near Dryden. Even the Soviets themselves go halfheartedly through the motions, as if they don’t really expect to score. As if it were somehow ordained the Canadians would win. With Gusev the last Soviet player to touch the puck, with the Canadian fans absolutely roaring out the countdown of the final seconds, Dryden hands off to Stapleton. Carefully, Stapleton carries the puck behind his net and passes up the boards to Mahovlich as the final horn sounds. Mahovlich lets the puck go by, Stapleton races after it, and the fans, as Foster Hewitt says, go wild. When Paul Henderson scored the winning goal, I was on the bench. I had just got off the ice, maybe 20 seconds before. When he scored the winner, I was jumping out of my jockstrap! After Henderson scored, the whole team jumped out on the ice, but the game wasn’t over and Harry knew it. There were still 34 seconds remaining, but the Russians never really tried after Paul scored. They were finished. They didn’t pull the goalie, they didn’t rush, they didn’t give it all their effort. I skated back to the bench and told Sinden, “Harry, I’m done.” I knew I couldn’t play those last 34 seconds. I was physically and emotionally drained. In any event, we held them off to win 6-5 and take the series four wins to three wit one game tied. When Paul scored that goal, I was one of the first guys over the boards. We were all huddled together. We started chanting, ‘We did it, we did it …’ but we still had 34 seconds to kill off. I was actually very honoured. Harry Sinden sent Pete Mahovlich and myself and Phil Esposito on to kill off that final 34 seconds. I remember Paul saying to me when the game was over, ‘That guy wasn’t going to go anywhere.’ I had him so wrapped up! For me, for myself I was pleased that Harry had enough confidence in me because a lot can happen in 34 seconds. In time the game began again, but it was all count-down, the longest loudest triumphant cry-out numbers may have ever received. “O Canada” roared out suddenly: Canadians for this moment softened, and gave up trying to sound like a lynch mob. In the final seconds it was the tour’s end, wedding, anniversary, christening, bar mitzvah, birth, birthday, New Year’s Eve, carnival, Day of Misrule — yes, and the Dieppe that ended with V-E Day! I went back to the bench exhausted. I said, “Harry, I’m done, the tank is empty!” There was no way I was going back out there for the final thirty-four seconds. We killed those seconds off, the clock wound down, and we had the greatest victory of our lives. We were desperate to win and it showed, and that was the difference really. We didn’t want to go don in history as the team that couldn’t lose to the Russians but did … and thanks to that third-period rally, we didn’t! After Pauly scored, we were ahead for the first time with only thirty-four seconds left in the game. I figured Harry Sinden wanted me to come out, but I looked at him like, Don’t you dare take me out. I was determined not to let them score. I never left the ice. I was not going off until the whistle blew. I was bad that way, but I could not help myself. I felt I had to stay out there. The puck came around the back of our net, and I got it, and I looked up to see that the time was running out, and when the horn blew, I looked up and cheered, and all the Team Canada players on the ice went crazy. The trumpeter from the Montreal Forum was sitting in the stands blowing loudly, and the Canadian fans in the stands — three thousand of them — were going crazy. When the game ended I found myself right beside Ken Dryden, and I grabbed him. All the guys came over. The emotion we all felt more than anything else was relief.